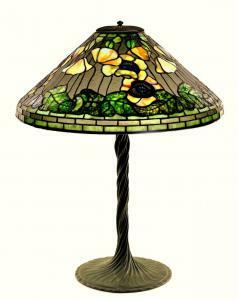 Circa 1905 Tiffany Studios table lamp with Poppy shade ($125,000). 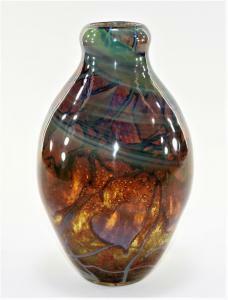 Tiffany Studios circa 1910 paperweight Favrile glass vase, 10 inches tall ($68,750). 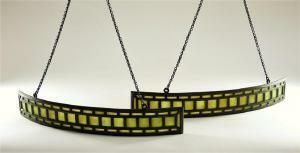 Pair of circa 1905 Tiffany Studios table lamp screens (or shields), both curved ($20,000). The enduring popularity of early 20th century creations by Tiffany Studios was on full display at the auction, held at Bruneau's gallery in Cranston, R.I.
CRANSTON, R.I., UNITED STATES, June 27, 2018 /EINPresswire.com/ -- CRANSTON, R.I. – The enduring popularity of early 20th century creations by Tiffany Studios was on full display at an auction held June 23rd by Bruneau & Co. Auctioneers, where a table lamp, a glass vase and a pair of lamp screens, all made by the New York design firm, sold for a combined $213,750. The sale was held in Bruneau’s gallery, at 63 Fourth Avenue in Cranston.